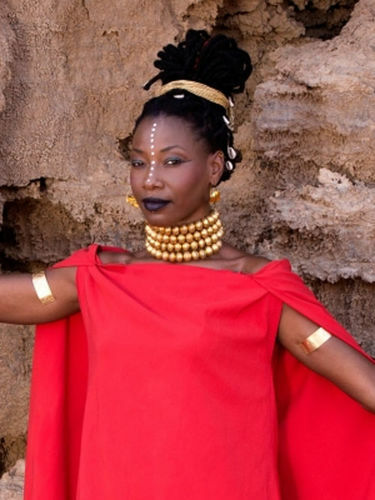 Malian singer Fatoumata Diawara (aka Fatou) was born of Malian parents in the Ivory Coast in 1982. As a child she became a member of her father’s dance troupe and was a popular performer of the wildly flailing didadi dance from Wassoulou, her ancestral home in western Mali. She was an energetic and headstrong girl and at the age of twelve her refusal to go to school finally prompted her parents to send her to live and be disciplined by an aunt in Bamako. She was not to see her parents again for more than a decade. Fatou also performed a variety of roles on stage, around the world, including tours in Vietnam, Mexico and throughout Europe. During rehearsals and quiet moments she took to singing backstage for her own amusement. She was overheard by a director and was soon singing solo during the company’s performances. Encouraged by the audience reception, she began to sing in Parisian clubs and cafes during breaks from touring. Audiences, critics, and producers immediately responded to her exceptional talent and before long she was touring and recording albums, including ‘Seya’ the GRAMMY nominated-album by Mali’s star Oumou Sangaré and ‘Red Earth’ the GRAMMY-winning Malian project by celebrated American jazz singer Dee Dee Bridgewater. When each of these albums were released Fatou toured worldwide as singer and dancer with both projects.